After more than a century, Ingres still feels mysterious and modern. Madame Paul-Sigisbert Moitessier (1861) by Ingres. Even in his own time, many critics preferred Ingres's portraits to his historical, religious, and allegorical paintings. The portraits did not succumb to the fervent intoxications of the imagination typical of his grander conceptions -- such as the bizarre voluptuousness of The Turkish Bath or the Raphael adoration in The Vow of Louis XIII. Today, when there's little patience for such paintings, the preference for his portraits is even stronger. The exhibition that opens this week at the Metropolitan Museum of Art, Portraits by Ingres: Image of an Epoch, should therefore delight almost everybody. And yet, while admiring the master's acts of miraculous realism and purring over his silks and ribbons, no one should forget that other Ingres. He inhabits the portraits, too. To the scrutiny of the living, J.A.D. Ingres (1780-1867) brought one of the most mysterious, paradoxical -- and modern -- eyes of the nineteenth century. "This is not a portrait that gives pleasure," said a French critic of one great early Ingres; "it is a portrait that gives rise to dreams." Jointly organized by the Met, the National Gallery in London, and the National Gallery of Art in Washington, D.C., the exhibition contains 40 paintings and 92 drawings. The collection of drawings -- a brilliant show within the show -- complements the paintings. Some are preparatory studies, others portraits in their own right. Ingres could give every stroke of a pencil animation, breathing life not only into his figures but into each line on the sheet. "Portraits" is also complemented by a show organized by the museum's Costume Institute, "Costume and Character in the Age of Ingres." (Gary Tinterow organized the portraits for the Met, Richard Martin the clothing.) "Costume" evokes the ever-changing play of fashion during Ingres's epoch. The painter certainly took an obsessive interest in what his sitters wore, often encouraging them to put on a certain dress or piece of jewelry. Many critics over the years have complained that Ingres took more interest in the dress than in the woman. But why shouldn't he have? Often the dress was more interesting than the woman. In fact, Ingres selected the subjects of his major portraits carefully, hoping to use them for purposes beyond the merely descriptive. T. S. Eliot once observed that a play by Shakespeare could appeal to every taste because it occurs on so many levels, the most simple being a melodramatic plot. Something similar is true of Ingres. Anyone -- even a person with no eye for painting -- can enjoy his astonishing feats of depiction, which claim the eye the way a plot captures the mind. The somewhat more observant can also enjoy the way he conveys individual character. He was particularly good, for example, at rendering that slightly quizzical arch of the eyebrow and half-smile that precedes the bon mot. In the Frick Collection's Vicomtesse Othenin d'Haussonville, née Louise-Albertine de Broglie, the curving shape of the flirtatious vicomtesse forms a kind of delightful question mark. Her index finger is cocking her head: She awaits your riposte. And her eyes suggest that if you should be charming enough . . . But Ingres rarely settles for character alone. He was a master of the particular who always sought the ideal: The "reality" of appearance or temperament frequently yields to loftier imperatives of the imagination. The vicomtesse at the Frick, whatever her personal manner, incarnates something eternal -- a quality of lighthearted feminine grace. She is a sylph in modern dress. 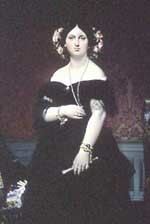 By contrast, Madame Paul-Sigisbert Moitessier, née Marie-Clotilde-Inès de Foucauld bears a heavier symbolic burden. To many people today, she may appear stolid and even rather piggish -- a remote statue. But Ingres had no wish to give her the vivacity of the vicomtesse. His contemporaries immediately likened Moitessier to Juno, the queen of the gods, and such a figure naturally has weight. The last room of the Ingres exhibition contains a modern Olympus -- a collection of contemporary goddesses who ruled over Parisian fashion and society. Reality in Ingres also yields, repeatedly, to the call of art. Even admiring critics often complain of something "wrong" in an Ingres picture. They consider the proportions awry (an arm is too fat) or the color off (a lilac blue clashes with the blue of a table). Artists rarely make the same mistake -- they understand that Ingres did such things intentionally, because art sometimes loves tension and surprise. Degas took pains to defend the fat arms of Moitessier since, as an artist, he was less interested in the woman than in the extraordinary relation of the shapes in the painting. Similarly, the left arm of Madame Jacques-Louis Leblanc, née Françoise Poncelle might appear as long as an elephant's trunk to some people. But there is such sublime languor in the slow, elegant sweep of that arm; more realism would have represented a terrible loss. And the necklaces in Ingres . . . they make fantastic, whimsical journeys across the bodies of women. Artists such as Degas, Picasso, de Kooning, Gorky -- all great draftsmen -- could never get enough of Ingres's "line." They were simply besotted with its beauty. Although Ingres steeped his subjects in the classical past, he could also make them powerful symbols of the political here-and-now. The great portrait Louis-François Bertin began as a tour-de-force of realism; a heavy, well-fed man sits rooted on a chair, hands digging into legs, his frothy gray hair delicately rising above his anchored form. But the picture soon came to personify the rise of the powerful haute bourgeoisie during the reign of Louis-Philippe. For all its solidity, an Ingres painting like Louis-François Bertin never stops moving in the imagination. Is Ingres a man of the past or the present? Is he a voluptuary or a puritan? A realist or an idealist? The answer, of course, is that he is many contrary things at once. He sees the way we see, our vision inflected by the flux of fact, desire, and memory. He is a great modern Sphinx who makes lasting riddles of reality, embodying but not necessarily reconciling the contradictions of our culture. Table of Contents: Oct 11, 1999 issue of New York | Subscribe!